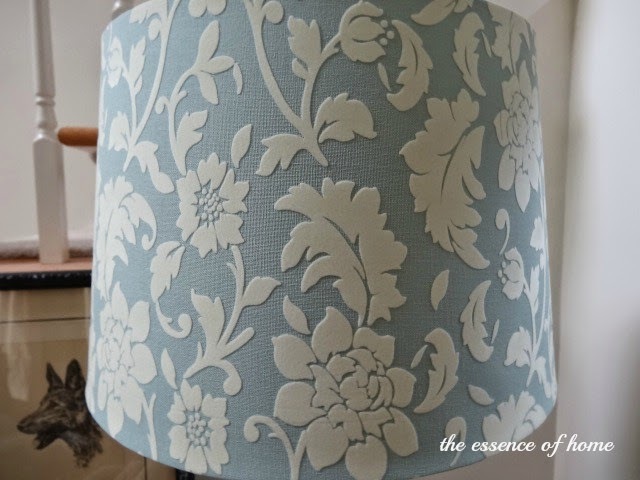 I recently stumbled across this beautiful blue and white lampshade while shopping at Target. I walked passed it thinking it was really pretty. So, I finished up my shopping and then returned to give it another look. And by golly, it ended up coming home with me! I figured that I could always return it if it didn't look as good in my home as it did in the store. 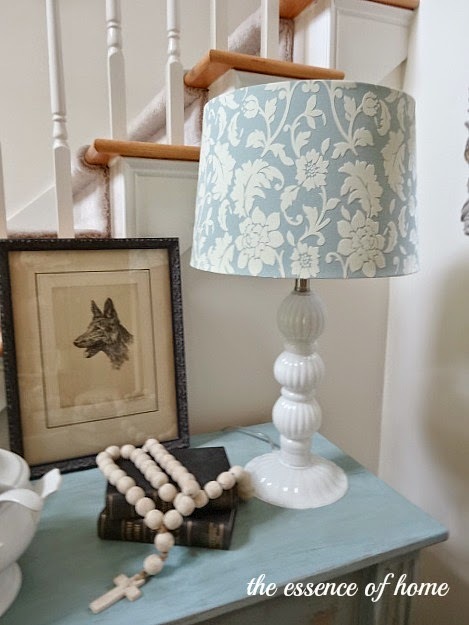 I had hoped it would bring in another touch of blue somewhere to coordinate with my newly painted blue dresser in the foyer. It coordinated SO well, that it landed on top of that dresser! Here is a close-up of the shade. The white flowers are actually raised on the shade. But, my favorite part is how it looks at night when the light is shining through it. It almost looks like lace. The blue color sort of fades away and just leaves you with the pattern on the shade. I added it to a lamp base that I already had. It's a white glass base that reminds me of milk glass. So, I'm pretty happy with it!. I decided to put the lamp, that was in here, in my kitchen. I missed not having a lamp in there. My husband and I have been working on our front porch over the past few days. So, I should be able to share that with you soon. I absolutely love that combination! The lampshade is beautiful with the light on. Where did you find that amazing lamp? I LOVE it! It does look like lace at night. What a beautiful shade! It looks wonderful in your foyer. Love your new lamp shade....it looks so pretty at night too! Love the new lampshade. 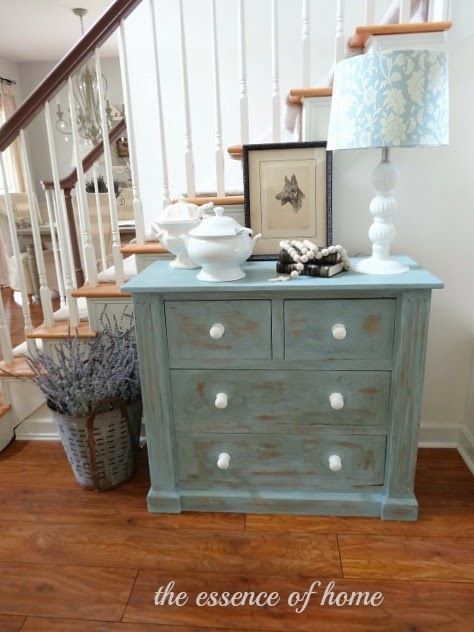 It is gorgeous with your new entry dresser. Gotta love Target! Oh, how pretty! I just bought an old floor lamp for my living room thinking I could add a nice modern shade, but I can't find one to fit. Darn! That is a beautiful shade Kelly. I especially luv the look of it at night. The shade is beautiful and goes so well with the paint job on the chest. I need to find a bunch of lavender for my olive bucket. Kelly, I love it! I was in Target Monday and I ALWAYS go down the lamp aisle, though I most certainly don't need another lamp. Most of all I love the raised part. How pretty! Perfect for your corner. I always find if I keep going back for something, it's speaking to me and it usually works perfectly. i love it on too and in the pic. it looks like the raised part is blue. Love the lamp shade...so pretty!! I might have to go to our Target here in town to see if they have this shade. The quilt on our bed is a soft blue with soft green and I've been wanting some new shades for the lamps on our night stands. Wow...is that lamp shade pretty when on!! I love that shade. It does look esp nice at night. Love the blue. I really love this shade, Kelly and it looks perfect in your space! Can you believe I have this shade in my living room...and it's orange! Yes, orange. It's right at home in your foyer, Kelly! I love when I find great things like that at Target! Love that shade Kelly! It is so beautiful when the lamp is on. 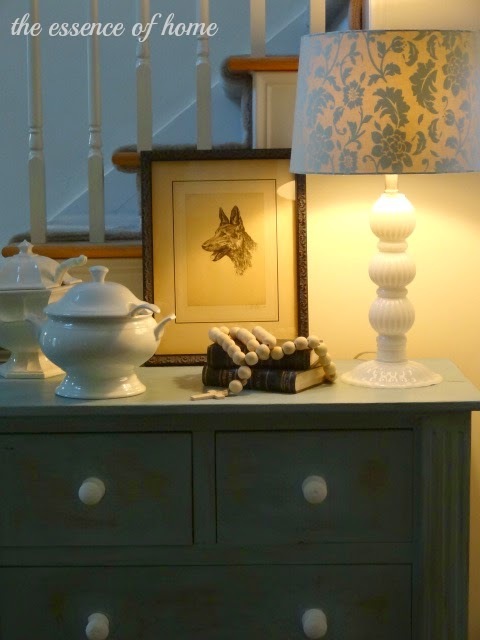 Very pretty Kelly....I am sure you are happy it landed in your cart...love that glass lamp!! I love this look -- so fresh and classic and summery! I find it best to just go ahead and act on those visceral reactions to something, because you can always return it if it is a mistake. This one is a winner! Kelly, this is such a gorgeous shade and how it changes when the lamp is lit is fantastic. Good thing you went back and it happened to jump in your cart. That is beautiful and goes in your house just delightfully! I would have purchased the lampshade, too! 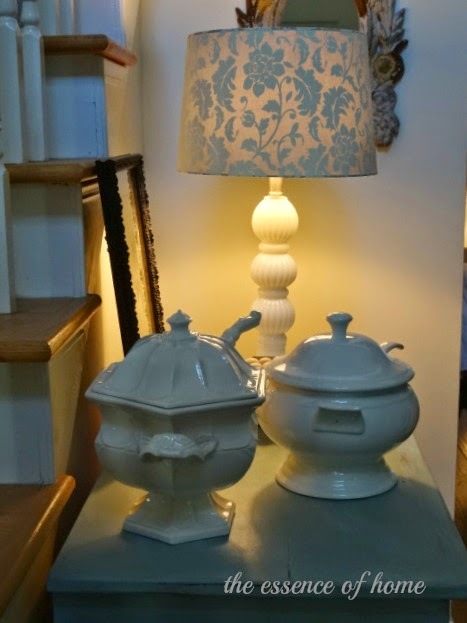 I'm a sucker for a pretty lamp (and buy too many lampshades as a result!) Love the tureens, too (I collect them also) and the color of that shabby dresser! Found you over on Must Love Junk and I'm your newest follower! Simply stunning!!! 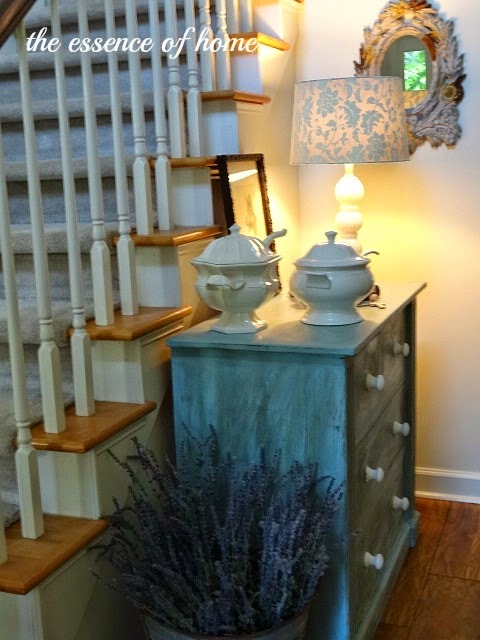 It is the perfect accent to your entryway!! You have such a great design sense!! Thanks for sharing with us all!! I love your new lamp shade! It's perfect for that spot and it looks fabulous with the light on! I adore this lamp! It's full of texture, which for me is so important, and the color is scrumptious! Great find Kelly! I have that same shade and love it! A perfect touch to your corner. And I love that dog print, too!